Heat shrink cable end caps are used to seal de-energised (dead) cables preventing moisture ingress into the cable via exposed cable ends. Cable caps are made from semi rigid, self extinguishing polyolefin heat shrink with a hot melt adhesive lining. The adhesive lined heat shrink cable cap creates a seal onto the cable sheath and effectively seals the exposed cable end. 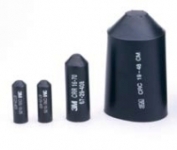 Heat shrink cable end caps are suitable for use on low voltage and high voltage polymeric (XLPE) and paper insulated, lead covered (PILC) cables. Heat shrink cable caps ensure a reliable and quick solution for sealing cable ends in both indoor and outdoor applications whilst offering excellent electrical and mechanical protection. Heat shrink cable caps are available to seal single and multi-core cables, 1.5-1000sqmm.